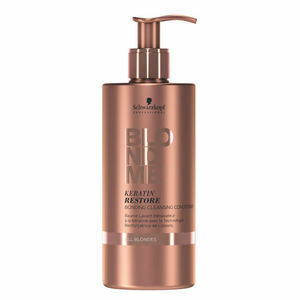 Enhance that iconic blonde look with an intensive boost of conditioning TLC. Schwarzkopf Professional BLONDME Keratin Restore Bonding Cleansing Conditioner ALL BLONDES takes your clients' blonde hair and intensively repairs, protects and nourishes it! It's a product that is ideal for all blondes: natural, lightened or highlighted—creating new bonds within the hair fibres while softening, smoothing and conditioning for the perfect shiny finish. Hair is left brightened and illuminated with a radiant finish. This conditioner is designed to maintain, protect and enhance iconic blonde colours—and that's just what it does! Available in a 500-ml bottle. £15.48 (inc. VAT) Why no VAT? We're a trade wholesaler and quote our prices without VAT to help our VAT-registered customers understand the true cost of a purchase. 6 shades of lifting cream for up to 5 levels of lift. Made with Integrated Bond Enforcing Technology to protect hair bonds for beautifully conditioned results. A deeply nourishing, protective conditioner that repairs hair from the inside out, leaving it wonderfully soft with a high gloss shine. Available in a 200-ml tube. Terrific restorative hair mask that intensively repairs the internal structure and strengthens hair elasticity for all types of blonde hair. Available in 200-ml or 500-ml pots. Rich and restoring shampoo that smoothes and conditions blond hair whilst creating new bonds within the hair fibres. It's available in 250-ml or 1000-ml bottles. Luxurious leave-in serum that is an anti-frizz treatment that smoothes and cares whilst giving blonde hair extra shine. Available in a 150-ml bottle. A choice of Bonding Masks that work to create new bonds within hair's fibres and provide for longer blonde colour retention. Both Enhancing Masks come 200-ml pot. Bond-enhancing shampoo that refreshes colour and cares for both cool and warm blondes. It's available in 250-ml tubes or 1000-ml bottles (COOL BLONDES only). A pigment-enriched leave-in spray conditioner with cool ash tone shading that will care for and moisturise hair. Available in a 150-ml spray. I ordered the G2 brush, when i first opened the box, i thought it felt a bit odd, it felt almost cheap and childlike, it's practically weightless, but having used it on people. My opinion dramatically changed! The G2 is a perfect size of getting a brushed out beach wave on long hair and can even create curls if pinned up and only finger combed out. I WILL be getting the entire set! Did I mention it halved my blowdrying time! I contacted YS park directly as I heard of bristle melting, insure the hair is rough dried 80% of the way, and use the drier on high speed MEDIUM HEAD only! Seriously, it works!